Radio frequency identification (RFID) is an automatic wireless data collection technology with a long history. The fundamentals of RFID technology are based on electromagnetic energy studies. For the last two decades RFID tags have been used in many applications (e.g. automatic toll roads, smart cards, store theft protection, access control, animal tracking, item tracking, etc.) which supply chain management and item tracking have been the fastest growing areas. Improvements in semiconductor technology resulted in a reduction in the size of circuitry and the cost of tags, as well as increased functionality and reliability, which sped up the industrial applications of RFID. 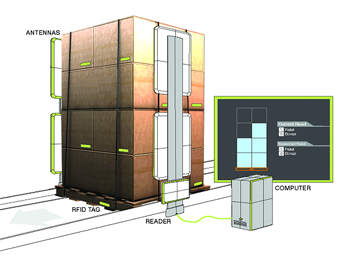 A basic RFID system consists of a computer with software connected to an RFID reader and one or more reader antennas, which communicate wirelessly with tags. An RFID tag is a device that can store and transmit data to a reader in a contactless manner using radio waves. Tags have three main components: an integrated circuit (or chip), an antenna and a substrate. They can also have a battery, which allows the integration of sensors. Tags are available in a wide variety of sizes, shapes and functionality which determines their unit cost and preferred application. At our lab we constantly seek new ways to exploit the ability of RFID technology to add value to business processes within the organization. We regularly evaluate new hardware and software available on the market in terms of commercial potential. Our team works closely with software engineers to provide unique solutions to individual organizations. We offer the perfect combination of pilot testing facilities and expert knowledge on RFID customization for individual supply chains both domestic and international. The RFID Center for Applied Research is equipped to test different aspects of the fresh produce supply chain, including pre-cooling, transportation, and storage simulation. Different methods of packaging have been designed and implemented through this research to reduce loss from temperature fluctuations and mechanical damage. The lab is equipped with three environmental chambers, one with an integrated vibration test system, a plenum, anemometers, and multiple temperature monitoring devices to replicate real-world conditions with the ability to control extraneous variables. Among some of the equipment developed by the RFID Center for Applied Research is a one-of-a-kind temperature controlled anechoic chamber. This chamber allows for the testing of temperature sensitive products under a strictly controlled environment. The chamber walls are covered in material designed to absorb radio waves from both inside and outside the chamber environment. Previous testing utilizing this chamber involved several pharmaceutical companies and their research into establishing FDA regulations in regards to the usage of RFID tags with biologics. The Department of Defense (DoD) ships containers of food rations to deployed soldiers all over the world. These rations have a 2-year shelf life when stored at proper temperatures. Monitoring temperature during transportation and storage of those rations is essential to provide quality foods to our soldiers. The initial goal was to identify sensor-equipped (temperature, humidity, etc.) RFID technology and develop automated knowledge system capability to determine the remaining shelf life of operational rations in the DoD supply chain based on remotely monitored temperature history. The goal of this project is to develop a temperature monitoring system that relies on RFID technology for wireless information transfer, remote monitoring, and prediction of remaining shelf life of rations and perishable products. 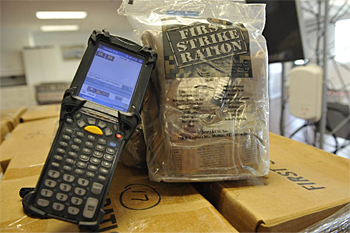 This data will be compatible and integrated into the US Army database via handheld readers, allowing logisticians to plan for steady flow of rations and other food supplies to support military personnel (i.e. which rations should be discarded or selected for issue first, and where rations can be shipped with confidence that quality requirements will be successfully met upon arrival). This project involved testing the latest in perishables quality monitoring systems. Several technologies the lab has researched implementing involve wireless updates which provide a continuous program for monitoring produce freshness and quality as it travels through all steps of the cold chain without human involvement. These modern tools allow a shipment to be tracked with real-time updates and provide vital information that can affect the quality, such as temperature and relative humidity of perishable products from inside the carton/package along with its up to date location. Using the real time information enables users to make intelligent decisions and corrective actions based on actual facts, so that they can cut their supply chain waste and successfully deliver top quality perishable merchandise to customers. 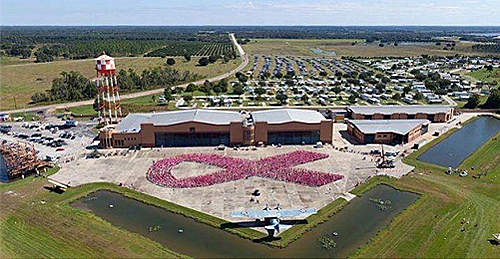 On October 22nd 2011, several thousand Florida citizens participated in an attempt to form the world's largest human awareness ribbon in Polk City, Florida. UPM RFID, the University of South Florida (USF), and Borda Technology supplied the RFID technology to document their efforts. 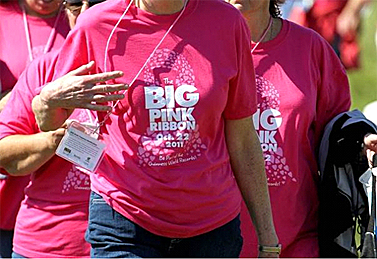 The three organizations used UHF tags, RFID technology, and custom software to accurately count participants of the Big Pink Ribbon event, who hoped to break the Guinness World Record of 3,952 individuals in this category. With 2,334 participants we were shy of the world record, but truly accomplished the ultimate goal of cancer awareness while promoting cutting edge RFID research being carried out in the lab. Applying RFID solutions for the consumer market is a key component of the RFID Center for Applied Research. The goal of this research is utilizing the center's extensive knowledge in RFID while tailoring the technology to individual demographics. One way we are applying this methodology is in the development of an RFID enabled "Smart Fridge". At our lab we have a long standing relationship with many major international pharmaceutical companies. A major source of concern to these pharmaceutical companies at present is whether prolonged RF exposure will have any significant effect on their products. To meet commercial requirements we have an anechoic chamber with which we can offer product integrity testing of biologics and biopharmaceuticals when exposed to commercially standardized RF frequencies over prolonged periods of time. Once this stage is complete we also encourage the use of our state of the art closed loop conveyor systems, which is ideal for off-site pilot testing. This is where the right RFID system is developed to avoid costly commercial downtime. Utilizing this method of testing is also proven to provide a smoother and timelier commercial roll out. Cephalon facilitated a program to serialize marketed products through the use of 2D Data matrix barcodes and RFID tags on unit-level products. (Serialization forms the basis of future e-pedigree requirements and similar initiatives currently proposed in several states and countries for the sale of pharmaceutical products.) The infrastructure to serialize products with RFID was previously installed on one of Cephalon's production lines. However, when used according to the original design, the performance of the RF write-read station did not meet an acceptable criterion. 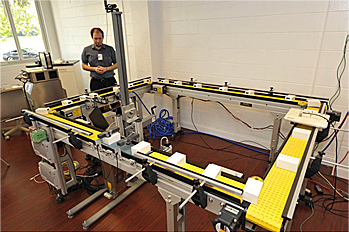 Our team worked with Cephalon to determine combinations of RFID hardware and software parameters that would lead to repeatable performance, which was validated in our lab using equipment simulating the write-read station on the carton conveyor. The simulation software was made in collaboration with Borda Technologies. The candidate solutions have been successfully validated directly on the packaging line in Salt Lake City during the maintenance shutdown of August 2011. Transportation is a wide field encompassing a vast amount of freight aboard different mediums such as air, sea, and rail. RFID already plays a major role in today's transportation industry, from tracking cargo containers across the globe to automatic payment for toll roads, our everyday life includes RFID whether we are conscious of it or not. Our team at the RFID Center for Applied Research has many years of research experience in transportation, both from a cold chain perspective and a track & trace technology implementation standpoint. For realistic testing of commodities and equipment during simulations of various ground and air transportation methods, an environmental test chamber was constructed with an integrated vibration test system. This unique setup allows for accurate and reliable analysis of both passive and active RFID systems through a wide range of temperature profiles. With today's globalization, there is a growing need for fresh products to be delivered year round all over the world. Due to increasing demand for just-in-time delivery, containers packed by third parties, limited inspection time, and transportation security linked to volume; having the monitoring of goods within the containers themselves in addition to the cargo warehouse will contribute to enhanced security, operation efficiency, and provide valuable real-time information. Locating single items as well as unit load devices in real-time can provide visibility that not only the shipping company benefits from; but also customers, who see value in knowing where their shipments are. The Department of Transportation, Florida's Turnpike Enterprise (FTE), plans to evaluate a second source transponder for the use on the SunPass System. The success of this testing will allow regional and national interoperability. Tests will focus on both open road and plaza environment capabilities, and will adopt a tiered performance approach for different scenarios in order to recognize and quantify system parameters in both cases. Ismail Uysal received his Ph.D. in Electrical and Computer Engineering from the University of Florida (UF) in 2008. He continued his academic studies as a postdoctoral research fellow at the UF Research Center for Food Distribution and Retailing until 2010. Since then, he has been with the University of South Florida where he is an assistant professor of electrical engineering and the director of RFID Center for Applied Research under the College of Engineering. He concentrates his research on applications of radio frequency identification (RFID) for pharmaceuticals, healthcare and cold chain, remote environmental modeling and smart sensory data analysis/algorithm design. Magalie is doing her postdoctoral work with Dr. Uysal in the RFID Center for applied Research. She graduated in 2010 with a doctorate in Agricultural and Biological Engineering from the University of Florida. Her thesis subject was on RFID applications for air cargo operations. Prior to graduate school, she studied Food Engineering at Université Laval (Quebec, Canada). Magalie was exposed to applied research early on during undergrad and immediately knew that she would follow that route for a long time. Throughout her studies, she has had the chance to work with the industry on many different projects, all of which were very applied. Witnessing the direct impact of her work has always kept her motivated. Dr. Laniel's research interests include radio frequency identification (RFID) for cold chain, logistics and particularly air transportation. She also have a passion for sailing, which adds to her appreciation of being here in Florida. Ultan received his Ph.D. degree in Biosystems Engineering from University College Dublin, Ireland in 2010 in the Assessment of UHF RFID as an Automatic ID Data Carrier for Item level Food Supply Chain Traceability in the Irish meat Industry. He also holds an MBA degree specializing in UHF RFID and the EPCglobal Network as an Organizational Competitive Tool toward a Sustainable Competitive Advantage. It highlighted the value of utilizing information from RFID integration within the organization. His current areas of interest include Smart Supply Chain Management dynamics and security enhancement via RFID technology. He is also working on smart decision support systems adding value to the Supply Network and also collaborating in the development of RFID ROI models. Working with the RFID Center for Applied Research gives him the ideal opportunity to work closely with Industry partners. Elliott J. Brecht is a research engineer who received his undergraduate degree in Biological Engineering from the University of Florida. Prior to his graduation he has worked at several different laboratories across Florida. Before and while working with the RFID Center for Applied Research he has been fortunate to have traveled to several countries across the world. He is currently working towards his masters in Biomedical Engineering here with the University of South Florida in Tampa. He would like to pursue his PhD. in a new location before eventually returning to the central Florida area. Andrea Lowe is a research engineer with the RFID Center for Applied Research. She graduated with a bachelor's degree in Biological Engineering from the University of Florida, working with the post-harvest laboratory there before joining USF. Her previous work has been focused on various aspects of cold chain management and real-world testing. She enjoys the opportunity she has been given to work with individuals from a wide variety of disciplines in both academia and industry. Ricardo is our newest team member, coming from Spain. He received his bachelor degree in Agricultural Engineering with a major in Agricultural Economics from the Polytechnic University of Madrid. During his undergrad, Ricardo worked on multiple research projects involving sustainable production of fruits and vegetables, logistics for cold chain monitoring of food and health products, as well as smart sensors for food quality control. Ricardo was recently awarded The Horticultural l Science Spanish Society Award for Bachelor Degree Thesis. The title of the project was Monitoring Cold Chain of Horticultural Products with RFID and Wireless Sensor Networks with in Cold Warehouses. Charles Khalil is a mechanical engineer with the RFID Center for Applied Research. He received a B.Sc. in Agrisystem Engineering and a M.Sc. in Mechanical Engineering from the University of Florida. I. Uysal, and M. Laniel. “RFID problem solving for item level serialization on a pharmaceutical packaging line”, Journal of Pharmaceutical Innovation, (Submitted). M. Laniel, U. Mc Carthy, and I. Uysal, “Wave Propagation: An RFID Perspective”, Book chapter in Wave Propagation, Academy Publish, (Accepted). I. Uysal, C. Hohberger, S. Rasmussen, D. Ulrich, J. P. Emond, and E. Altunbas, “Effects of radio frequency identification related radiation on biologics”, PDA Journal of Pharmaceutical Science and Technology. I. Uysal, C. Chandler, D. Ulrich, T. Prusik, and R. Seevers, “<1118> Monitoring Devices – Time, Temperature and Humidity”, book chapter in US Pharmacopeia National Formulary, (in press). U. Mc Carthy, G. Ayalew, G. Corkery, M. Laniel, I. Uysal, F. Butler, K. McDonnell, S. Ward, and J.P. Emond, “Sustainable Global Food Supply Networks”, in Sustainable Food Processing, Editor: T. Norton, B. Tiwari and N. Holden, Publisher: Wiley-Blackwell, (in press). D. S. Hill, S. Ward, U. Mc Carthy, G. Corkery, B. Kernan, J. Bracken, N. P. Baadsgaard, and I. Uysal, “GS1 EPC Animal RFID Eartag Guideline”, www.gs1.org/epcglobal, 2012. U. Mc Carthy, G. Ayalew, G. Corkery, M. Laniel, I. Uysal, F. Butler, K. McDonnell, S. Ward, and J. P. Emond, “RFID and the EPCglobal Network as a Pivotal Tool in the Development of a Sustainable Organisational Competitive Advantage”, book chapter in Advances in Business and Management, Nova Publishers, 2012. I. Uysal, J. P. Emond, and G. Bennett, “Tag testing methodology for RFID enabled temperature tracking and shelf life estimation”, IEEE International Conference on RFID Technology and Applications, 2011. M. Laniel, I. Uysal, and J. P. Emond, “Radio frequency interactions with air cargo container materials for real time cold chain monitoring”, Applied Engineering in Agriculture, 2011. U. Mc Carthy, G. Ayalew, F. Butler, K. McDonnell, and S. Ward, “The case for RFID application in the meat supply chain in the Irish context”, Agricultural Engineering International: the CIGR Ejournal, 2011. I. Uysal, J. P. Emond, and G. Bennett, “A computationally efficient and scalable shelf life estimation model for wireless temperature sensors in the supply chain”, International Conference on Modeling & Applied Simulation, 2011. M. Laniel, J. P. Emond, and A. E. Altunbas, “Effects of antenna position on readability of RFID tags in a refrigerated sea container of frozen bread at 433 and 915 MHz”, Transportation Research Part C: Emerging Technologies, 2011. I. Uysal, J. P. Emond, M. C. Nunes, and J. K. Brecht, “Remote Environmental Monitoring and Diagnostics in the Perishables Supply Chain”, US Army Contract W911QY-08-C0135 Final Project Report, 2011. I. Uysal, and J. P. Emond, “Department of Defense RFID shelf life study phase II: adaptive and dynamic shelf life estimation using RFID”, RFID Journal Live 2011, Orlando, 2011. I. Uysal, and J. P. Emond, “RFID in pharmaceutical supply chain: the regulations, physical limitations and a real-life study”, RFID Journal Live 2011, Orlando, 2011. I. Uysal, and J. P. Emond, “Improving the combat rations supply chain with RFID temperature monitoring”, RFID in Defense 2011, Washington D.C., 2011. U. Mc Carthy, G. Ayalew, F. Butler, K. McDonnell, and S. Ward, “Ultra High Frequency (UHF) Radio Frequency Identification in Food Supply Chain Management Applications”, book chapter in Supply-Chain Management: Theories, Activities/Functions and Problems, Nova Publishers, 2011. I. Uysal, J. P. Emond, and G. Bennett, “RFID enabled temperature tracking for use in shelf life estimation”, Workshop on Novel Sampling and Sensing for Improving Food Safety, Atlanta, 2011. I. Uysal, and J. P. Emond, “Modeling effects of temperature and other environmental factors on produce quality”, 2011 Workshop on Strategies to Deliver Flavorful Produce to Consumers, Davis, 2011. 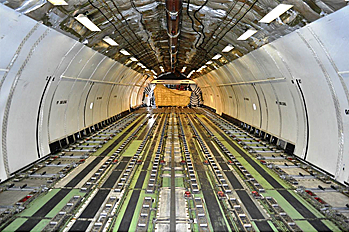 M. Laniel, I. Uysal, and J. P. Emond, “Radio frequency propagation inside the cargo hold of a DC-10 aircraft”, International Journal for RF Technologies: Research and Applications, 2011. M. Laniel, I. Uysal, and J. P. Emond, “Air cargo warehouse environment and RF interference”, International Journal for RF Technologies: Research and Applications, 2011. I. Uysal, P. W. Dehay, E. Altunbas, J. P. Emond, R. S. Rasmussen, and D. Ulrich, “Non-thermal effects of radio frequency exposure on biologic pharmaceuticals for RFID applications” Proceedings of IEEE International Conference on RFID, Orlando, 2010. U. Mc Carthy, G. Ayalew, F. Butler, K. McDonnell, and S. Ward, “The effect of increased Interrogation zone, reader Antenna Polarisation and application factors in the performance of UHF RFID tag detection on Modified Atmosphere Packaged Meat”, Packaging Technology and Science, 2010. I. Uysal, and J. P. Emond, “Using RFID to estimate shelf Life dynamically,” RFID Journal Live 2010, Orlando, 2010. I. Uysal, and J. P. Emond, “Radio frequency radiation: can RFID be used for biopharmaceutical supply chain?”, RFID Journal Live 2010, Orlando, 2010. I. Uysal, and J.P. Emond, “Food traceability and product recalls: smart and dynamic shelf Life estimation using RFID”, Auto Identification and Mobile Information Technologies Expo, Chicago, 2010. M. Laniel, and J. P. Emond, “Mapping of RFID tag readability in relation to the food content in a refrigerated sea container at 915 MHz”, Innovative Food Science and Emerging Technologies, 2010. U. Mc Carthy, G. Ayalew, F. Butler, K. McDonnell, and S. Ward, “The effects of item composition, tag inlay design, reader antenna polarization, power and transponder orientation on the dynamic coupling efficiency of backscatter ultra-high frequency radio frequency identification”, Packaging Technology and Science, 2009. U. Mc Carthy, G. Ayalew, F. Butler, K. McDonnell, and S. Ward, “Impact of reader antenna polarisation, distance, inlay design, conveyor speed, tag location and orientation on the coupling of UHF RFID as applied to modified atmosphere packaged meat”, Computers and Electronics in Agriculture, 2009. M. Laniel, J. P. Emond, and A. E. Altunbas, “RFID behavior study in enclosed marine container for real time temperature tracking”, Sensing and Instrumentation for Food Quality and Safety, 2009.